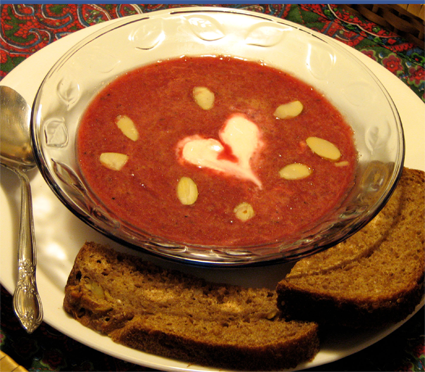 Beets are believed to be native to southern Europe and North Africa. They did not become popular until the 1800s. 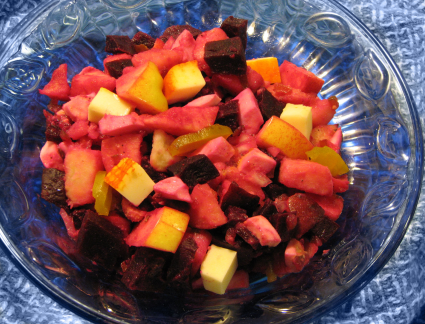 Beets were used frequently in ancient Greece and Rome. Beets come in three ways: the beet-crop thinnings, little ruby-green leaves with tiny beet roots; the fully-grown beet root; and the beet greens. All are used in cooking and salads. While beets are often only used these days for salads and pickles, they are one of the most delicious vegetables to heat hot, as an important soup ingredient or combined with other root or green vegetables. 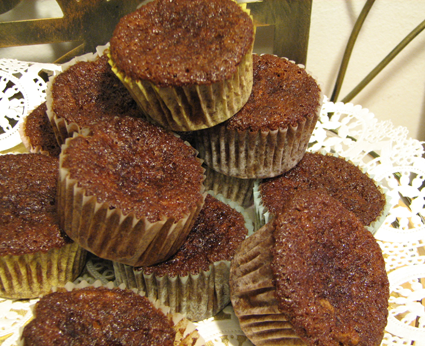 Because of their sweetness, they blend well with fruit like apples, oranges, or lemons. 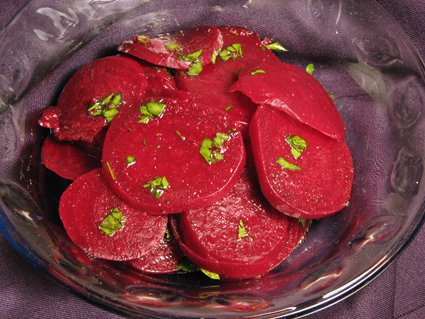 Beets are commonly boiled, but their flavor is better if they are baked. 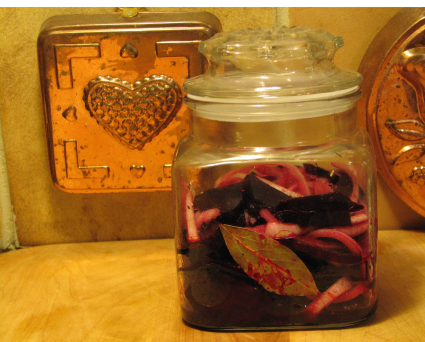 To boil beets, cut off the leaves, right above the beet itself, and wash the beets. Do not cut into or scratch the beets or their roots or the juice will run out during cooking and leave the beets pale. Put into boiling salted water. Cover and simmer gently until tender. Small beets will take 1 to 1 1/2 hours. Take from the water, cut off the roots, and rub off the skin and fibers. 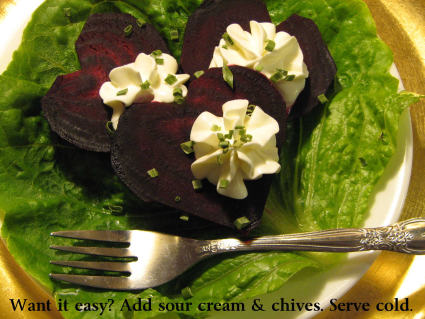 Chives and caraway are the best herbs to enhance the flavor of beets. Nutritionally, beets are not a major source of vitamins or minerals. 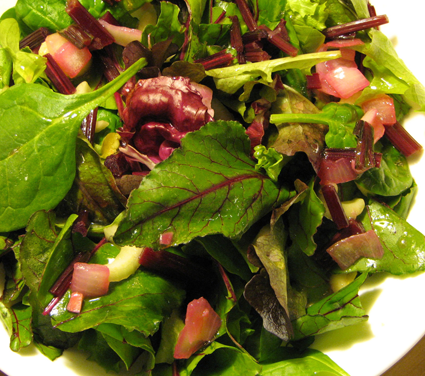 Beet greens are very similar to swiss chard, are high in vitamins A and C, and have a high mineral content. 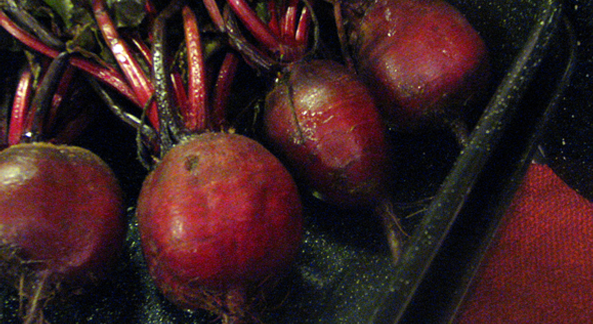 Raw beets without leaves will store for a month or more at about 40 degrees F in high humidity. To raise humidity, store them in a plastic zip lock bag. 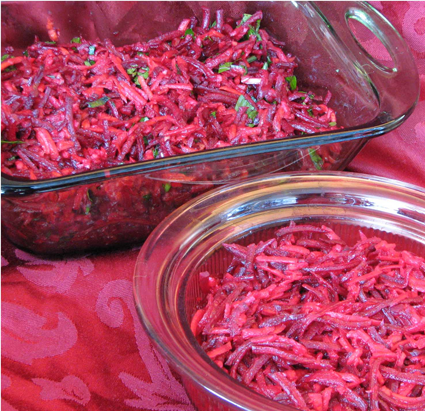 Gently mix beet, herbs, salt and sour cream. Place each serving on a cup of lettuce leaves and sprinkle with slivered almonds. Whisk the mustard, pickles, salt, vinegar, and oil together in a mixing bowl. Add the rest of the ingredients and fold together. Combine all ingredients. Best if chilled overnight. Remove the tough stems and tear leaves into pieces. Combine all ingredients. Remove the stems and thoroughly wash beet leaves. Let stand in cold water. Chop garlic, beet stems and onion. Sauté in sesame and olive oil in a large pan over medium high heat for 2 minutes until onion is translucent but not yet browned. Add wet beet leaves. Sprinkle with tamari sauce and grill seasoning. Cover. Let simmer over low heat for 8 to 10 minutes. Serves two. After you have the beets cooked, this recipe is very fast. It is basically salt & pepper, vinegar & oil, honey & mustard. By varing the type of vinegar, oil and mustard, you can create very different results. 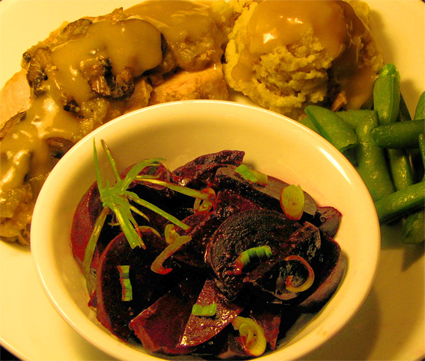 These beets can add a lot of color and zing to an ordinary meat and potato meal. Combine the mustard, honey, salt & pepper, vinegar, and oil. Stir in the beets. Serve sprinkled with sliced green onion. This is terrific cold or hot. Combine all of the first group of ingredients in a slow cooker. If you want a mild sweet taste for the onions and garlic, sauté them in a tablespoon of olive oil until soft and translucent before placing in the cooker. Cook on low for 6 to 8 hours or 4 hours on high. Remove the bay leaves. Add the yogurt and almond butter and process with a stick blender. The consistency should be smooth with some chunks left for texture. Add the tomato. Serve hot or cold with a dollap of yogurt and a sprinkle of almonds or sesame seeds, depending on whether you used the almond butter or sesame tahini. Instead of cooking for hours in the slow cooker, this can be simmered on top of the stove for about an hour. You can start with either cooked or raw beets. Combine all ingredients and refrigerate at least 2 hours. Serve with salad, cottage cheese or sour cream. Keeps for several days in an air tight jar, refrigerated. Preheat the oven to 350. Grease either a 9x5 loaf pan, a 9x9 baking pan, or a muffin pan. In a small bowl, combine the flour, baking powder, and baking soda. Place the sugars, oil, eggs, salt, and cinnamon in a large bowl. Mix well to combine. Add the flour mixture, the carrots, beets, pineapple, and walnuts. Stir gently until thoroughly mixed. Place the batter in the prepared pan and bake: 50 minutes for the loaf pan, 40 minutes for the 9x9 pan and 25 minutes for the muffin pan. The cake is done when a toothpick inserted in the center comes out clean.